I’m currently in the re-write stage of the third book in a series of novels of the ancient Maya. One of the characters imprisoned in a bamboo cage with the protagonist is the son of a ruler who has been captured for sacrifice. In a scene where both the physical and social environment of this primitive prison are barely tolerable, the protagonist observes the young lord sitting quietly with his eyes closed, seemingly unmoved by the shouting and fighting going on in the other cages. Asked how he can be so calm in the midst of this chaos, the young lord of the Macaw lineage tells the protagonist how his father taught him to “gather his feathers” in a storm. This image of a flamingo beautifully illustrates his lesson in equanimity—steadiness of mind under stress. Calm. Composure. The posture of this bird also reminds me of the social science phenomenon of “cocooning,” a term coined in the 90’s by trend forecaster Faith Popcorn to describe how individuals were socializing less and retreating into their homes more. Whereas the trend began in part because of the desire for more people to work at home (even air conditioning was a contributing factor), more recent insecurities such as increased incivility, gun violence and terrorism have contributed to it. And of course, advances in communications technology have made it much easier to keep the rest of the world at arm’s length. 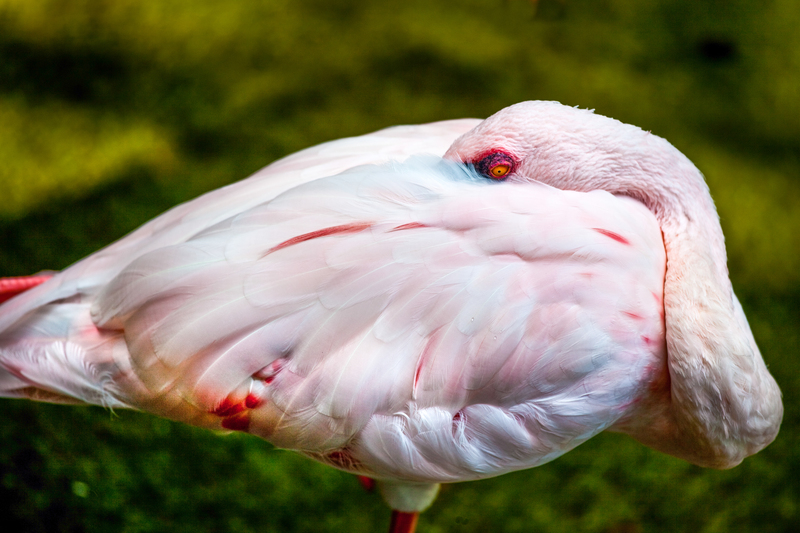 Whether or not we view cocooning as a positive or negative—perhaps both—the image of the flamingo gathering his wings with a watchful eye suggests to me an appropriate response to the winds that carry breakdown, disappointment, pain or grief. Resistance to these experiences makes them worse. Placing blame and railing against them only stirs them up and spreads the misery farther. Gathering ones feathers amounts to standing calm and watchful, allowing the storm to bring what it will. And pass. I’ve always lived with cats. One of the things I’ve observed that’s so marvelous about them, and animals in general—aside from their innate appeal and unique personalities—is that they respond to everything with equanimity. One day we picked up our cat, Indy, and he quickly retracted his paws. Normally they were pink. Now they were dark brown and rough. Yet he walked normally and didn’t vocalize. The vet diagnosed that his paws had been burned, probably from jumping up on the stove when one of the burners was still hot. Animals feel pain like we do, yet they respond to it with equanimity, doing what’s necessary to heal and in the meantime making themselves as comfortable as possible. Perhaps it’s easier for animals to maintain their composure because their operating systems are driven by instinct rather than self-awareness, but I think we can at least learn from them that acceptance with composure is the more balanced response. Oh yes, in my story, the young lord gathers his feathers by doing exactly what this flamingo is doing. It’s also what Indy did. Standing and watching. The word “grace” comes to mind. With so many viewpoints about any topic, if one person is aggressive about his viewpoint, it is likely to bring imbalance into the situation. What is required is a certain calm, a lack of ego, a lack of delusion that one sees all around every situation, and give some space for others to contribute other viewpoints which would allow the emergence of a balanced view, so that there might be balanced action. There has to be balance for there to be health at any level. Touring Disney World, we came to a place where there were a great number of flamingos. I singled this one out because of the exceptional composition, the mixed hues in his feathers and his open eye. Also, he was close enough that I could fill the frame with the telephoto lens. The only adjustments I made in Lightroom were to darken the background and increase the clarity to enhance the texture in his feathers. This entry was posted in Uncategorized and tagged Ancient Maya, animals, bird, cats, cocooning, composure, Disney World, Equanimity, feathers, flamingo, Florida, grace, gun violence, incivility, instinct, protagonist. Bookmark the permalink.